For a long time the young people in my district ha d been decreasing in number. We had been searching for answers on how to reach out to them and to cater to their needs that we may keep them in church. I feel so depressed when I see someone leave the church, especially if that person was once my partner in a church program. My heart would bleed each time I’d see a friend get drunk. I couldn’t help but cry to God for help. So I decided to focus not only on the “outreach” but also on the “in-reach” program. I looked for innovative plans where I could reach and be close to them again, so I could ask them to come back to church. One day I saw that their penchant was on sports, especially basketball. Some of my friends played basketball on Sabbath. Gradually, I saw them drifting away. I saw this as a big challenge, which inspired me to set up the Youth Sports Program in the province. 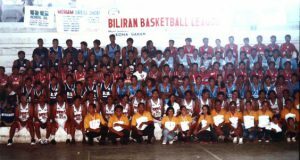 I called it BILIRAN BASKETBALL LEAGUE or BBL. I was quite happy when many government officials, including Mayors and Congressmen supported this program for the young people. My main purpose was to lead the young people back to church, and at the same time, minister to those who have not yet heard of God’s wonderful message. There were around 135 young people in 6 teams who joined BBL. One of the teams was the Prophets and Kings, whose sponsor was from the U.S. One night I talked with the sponsor of the Prophets and Kings Team on the phone. “I am thinking that because you’re sending dollars for your team, you’re probably expecting them to win. Sorry, but we cannot be sure of that” I told her. “Pastor, winning is not important to me. What is important is winning the lost souls. I am happy that my nephews are having Bible studies, and at the same time, those who had left the church are coming back.” Her reply was so exhilarating. Wow! What an encouraging comment! During the Grand opening of BBL, there were 8 young people who accepted Jesus through baptism and 3 of them were players from the Prophets and Kings Team. 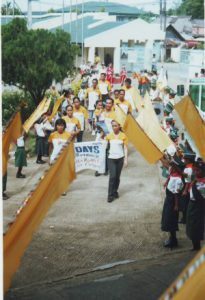 So, even though I faced a lot of oppositions and tremendous criticism, I was able to hold an evangelistic crusade for 4 months. The games lasted for 4 months just like that of the NBA. I scheduled our games only on Sunday. And before each game started, we had a devotional at 8:00 a.m. All the players were required to attend the devotionals. No devotional, no play. This was the rule. And I decided on what topics to talk about. I used a series of doctrinal sermons. Amazingly, the Holy Spirit moved the hearts of the young people. From its conception to its realization, I surrendered everything to the Lord so we could be on the right path. I sought advice from the East Visayan Conference Youth Director and elders and thank God, they supported us. I could still picture what happened during the closing song of our first devotional. Many young people were singing the church hymns again after a long time away from church. And they were singing with tears running down their cheeks. I was so glad to see my friends come back to church again. At this time, each church activity or program in our church is packed with young people because of the BBL Program. We have fellowship on Sabbath (Saturday) and the following day (Sunday), we have the game. The brethren are very happy while serving food until Sunday noon. We scheduled the church programs each Sabbath in the 4 churches in my district – one church at a time. So every Sabbath, we stay busy from Sabbath until Sunday. Today I preach and give Bible Studies to more than 100 young people. And by God’s grace I’ll be having another crusade this January 2008 and praying for a great success.